Women make up more than 40% of the workforce in countries where agriculture is a key contributor to GDP, including the MENA countries. However, they do not enjoy the same level of access to training, agricultural inputs and land as men. Not only does this prevent them from reaching their full potential, but also costs communities and economies. FAO reckons that if women had as much access to resources as men, agricultural yields could increase by up to 30%, helping to alleviate food insecurity for some 150 million people globally. Because women’s role in food production is rarely recognized officially, they also do not benefit enough from extension and training services that would teach them about new technologies. A recent FAO survey found that in Egypt only 1% of extension officers are women. Not only are women underprivileged in agriculture, they are also underrepresented in agricultural research and innovation. Empirical evidence shows that there is a disproportionately low number of women working in senior scientific and managerial positions, especially in the MENA region. 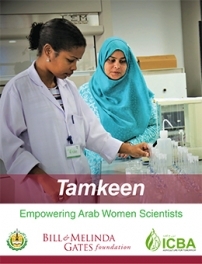 The average share of women scientists across the MENA region stands at 17%, which is the lowest in the world. This gender gap is most visible in the staffing of agricultural research and extension organizations. As a result, there is a concern that policy and investment priorities might not be as effective as they could be because they do not fully incorporate gender perspectives. Given women’s role in agricultural production and consumption, potential benefits are being lost when they are needed most.